Felix Tshisekedi and Joseph Kabila. Former Democratic Republic of Congo President Joseph Kabila’s coalition won a clear majority in senate elections officials said, further undermining his successor Felix Tshisekedi’s ability to govern independently. Opposition leader Tshisekedi won a surprise victory in the presidential election on December 30 over Kabila’s hand-picked candidate, Emmanuel Ramazani Shadary. Kabila was barred by term limits from standing for a new term after 18 years in power. Kabila’s Common Front for Congo (FCC) coalition won about 70% of seats in the lower house of parliament and an overwhelming majority of provincial assembly seats in elections held at the same time as the presidential election. In a statement, FCC national co-ordinator Nehemie Mwilanya said the coalition won more than two-thirds of 109 seats in the senate or upper chamber, in Friday’s elections, in which only provincial assembly members can vote. “The Common Front for Congo hails this resounding victory and confirms its supremacy as the premier political force in Democratic Republic of Congo,” Mwilanya said. Jean-Baudouin Mayo, an official from Tshisekedi’s CACH coalition, acknowledged the FCC had a clear majority. In addition to 108 elected senators, Kabila automatically gets a seat in the upper chamber as a former president. During the presidential election campaign, Tshisekedi promised a clean break with Kabila’s tenure, marked by persistent corruption, deadly militia violence in the east and prodigious production of copper and cobalt that failed to significantly improve living conditions. Supporters of his opponent, Martin Fayulu, accused Tshisekedi of striking a deal with Kabila to rig the presidential election when it became clear Kabila’s preferred candidate could not win. 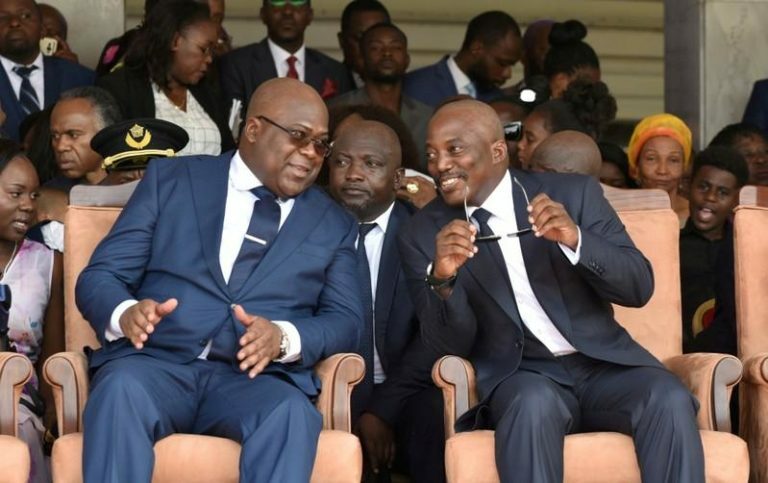 Tshisekedi and Kabila’s camps both deny any rigging but acknowledge talks about cabinet appointments under a power-sharing deal in line with Congo’s semi-presidential system. Friday’s senate elections were marred by widespread accusations of corruption. About 20 candidates from across the political spectrum withdrew over what they said were demands for bribes of tens of thousands of dollars. Tshisekedi took office in January in Congo’s first-ever transfer of power via the ballot box, Kabila’s cabinet ministers are still in place as negotiations over the nomination of a prime minister proceed. Tshisekedi made some breaks with Kabila-era policies, most recently by announcing he would free three prominent political prisoners and 700 others jailed under his predecessor’s administration.